Despite the scorching heat, one thing that we all look forward to in summer are rich, tropical, aromatic, sweet, ripe mangos. For all the mango lovers the season where you can relish your favourite fruit has officially started. 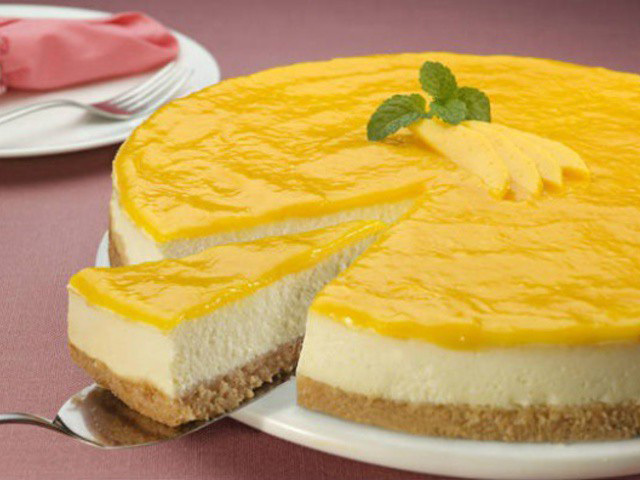 Chose your favourite type of mango and enjoy these delicious mango recipes. Take crushed biscuits in a bowl and mix it with cinnamon powder and honey. Make sure the honey is evenly mixed. Spread this mixture in a pie pan and refrigerate it. Using a blender, blend chopped mangoes to a smooth purée. Soak agar agar in ½ a cup of water for about 20-25 minutes. In a large container, take cream, vanilla essence, cream cheese and sugar and whisk this mixture till the texture becomes smooth. To this mixture, add mangoes and gently stir. Heat a pan on low flame, add soaked agar agar. When the agar agar solution becomes warm add the mango-cream cheese mixture and stir quickly and vigorously till mixed well. Switch off the flame and pour this mixture on the biscuit layer. Refrigerate for about 3-4 hours. Remove it from the refrigerator, unmould gently. Before serving garnish with whipped cream, mint leaves and chopped mangoes. Cut each mango in a crisscross pattern with a knife and expose the cubes of flesh. Remove the flesh from the cheek and stone, by peeling off the skin. Take a blender and blend these pieces into a smooth consistency. Take a large saucepan, on high heat boil 8 cups of water. Reduce the flame to medium and gradually add the tapioca seeds by stirring constantly. Simmer until the tapioca becomes transparent. To check if the tapioca is transparent remove a couple of balls from the water and hold them, the colour of the tapioca seeds should change from opaque to transparent. Now drain the tapioca seeds using a sieve and place it under cold water until it becomes clear. Transfer the tapioca seeds into a large bowl and add mango purée, coconut cream and sugar (if needed). 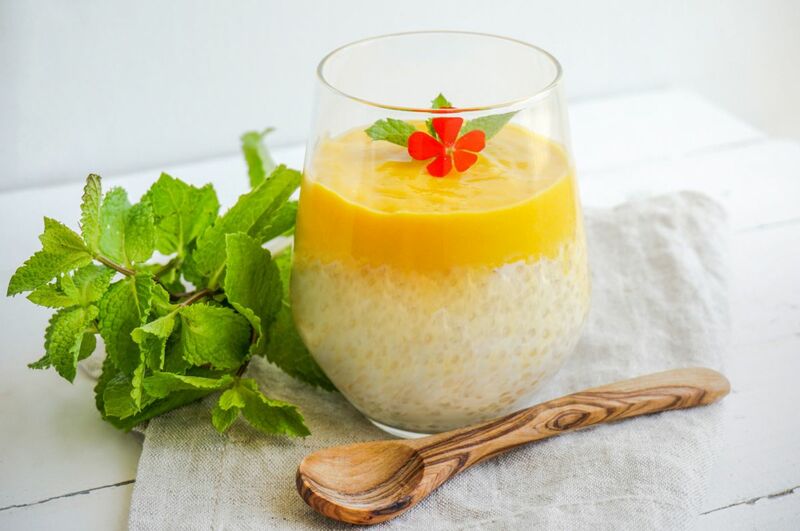 Divide the tapioca mixture in small containers and cover it with plastic wrap and place it in the refrigerator for about 45 minutes. Serve chilled with fresh mango slices on top.